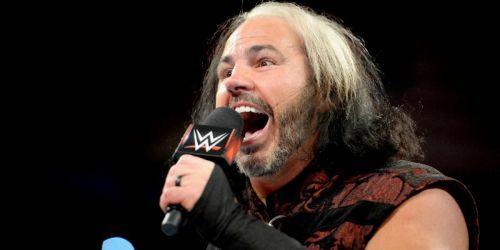 "WOKEN" Matt Hardy wants one last battle before calling it quits in the WWE, but with who? WWE Superstar Matt Hardy has been out of action for quite some time due to nagging injuries and unofficially went into retirement. However, it seems as though Hardy wants to have at least one last match against a certain WWE Superstar before hanging up the boots for good. Matt Hardy last wrestled at a WWE Live Event teaming with Bray Wyatt against the B-Team, Dolph Ziggler and Drew McIntyre in mid-September. This was believed to be his final match, as Hardy took a sabbatical from the ring to nurse his injuries. In the meantime, Hardy has been filming some specials for "House Hardy" for the WWE Network, along with acting as a producer/agent behind the scenes. As first reported by WrestlingINC through an interview with "myKhel" to promote the WWE and their products, Matt was asked who he would like to face in the WWE if given the opportunity, to which Matt replied with the following statement. "I would say that one person that I would be dreaming before retirement because I haven't got a chance to work with him. Now he's gonna be gone for a little bit in future…it'll be Roman Reigns," said Hardy. "He is kind of a guy that WWE built around and I do I like him a lot as a person. I consider him my friend. So I would love to have a Matt Hardy vs. Roman Reigns match before retirement." Who knows what is in store for Matt Hardy in terms of his WWE career. There are heavy rumors going around, specifically from Matt himself, that he would like to advocate for the position of RAW General Manager. That would make for some interesting television if this were to come to fruition. What do you think about Matt Hardy coming back to the ring? How would you feel about Matt Hardy becoming the next RAW General Manager? Let us know in the comments below. As always, stay tuned to Sportskeeda for all the latest wrestling news and results!